When the United Kingdom of Great Britain came into being on May 1, 1707, the window tax that had been introduced across England and Wales under the Act of Making Good the Deficiency of the Clipped Money in 1696, continued. It had been designed to impose tax relative to the prosperity of the taxpayer, but without the controversy that then surrounded the idea of income tax. At that time, many people opposed income tax on principle because they believed that the disclosure of personal income represented an unacceptable governmental intrusion into private matters, and a potential threat to personal liberty. In fact the first permanent British income tax was not introduced until 1842, and the issue remained intensely controversial well into the 20th century. When the window tax was introduced, it consisted of two parts: a flat-rate house tax of 2 shillings per house (comparable to £12.11 in 2014), and a variable tax for the number of windows above ten windows. Properties with between ten and twenty windows paid a total of four shillings (comparable to £24.21 in 2014), and those above twenty windows paid eight shillings (£48.43 as of 2014). Income tax was first implemented in Great Britain by William Pitt the Younger in his budget of December 1798 to pay for weapons and equipment in preparation for the Napoleonic Wars. 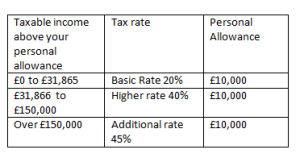 Pitt’s new graduated (progressive) income tax began at a levy of 2 old pence in the pound (1/120) on incomes over £60 (£5,511 as of 2014), and increased up to a maximum of 2 shillings (10%) on incomes of over £200. Pitt hoped that the new income tax would raise £10 million, but actual receipts for 1799 totalled just over £6 million. For more information on income tax, visit the http://www.hmrc.gov.uk/incometax/intro-income-tax.htm or contact us. PAYE (Pay As You Earn) is the system that HM Revenue & Customs (HMRC) uses to collect Income Tax and National Insurance contributions (NICs) from employees (including directors of limited companies). The tax and NICs is deducted throughout the tax year based on the employees’ earnings and then paid to HMRC. You must deduct tax and NICs from employees’ pay each pay period and pay your employer’s Class 1 NICs if they earn above a certain threshold. Your payroll software should do this. You will pay these amounts to HMRC monthly or quarterly. You must submit a Full Payment Submission (FPS) online, on or before each payday, to tell HMRC about payments made to all your employees and confirm the tax, NICs and other deductions. Again, your software should do this each time you run the payroll to calculate PAYE. You will need to do this regardless of the amount you’ve paid them or how long they’ve been working for you. You must pay the correct amount, based on your FPS submission on time. If you don’t you may have to pay interest or penalties. You must send PAYE returns electronically to HMRC each time you pay your employees as part of your routine payroll processes. These returns must include details of all employees’ pay, tax and deductions. You must do this by sending an FPS on or before each payday, either by using commercial payroll software or HMRC’s Basic PAYE Tools. All employees must be included on your FPS – no matter how much they earn – including students. As an employer you must operate PAYE on the payments made to your employees if their earnings reach the NICs Lower Earnings Limit (LEL). You must use the employee’s tax code and NICs category letter to work out how much Income Tax and NICs to deduct from the employee’s pay and how much employer’s Class 1 NICs you owe. You must make payments to HMRC by the 19th of the month (22nd of the month if paying electronically). You may be able to send the amounts due every quarter if your average monthly payments are likely to be less than £1,500. There have been changes to the State Pension age from 6 April 2010. The State Pension age for women born between 6 April 1950 and 5 December 1953 will gradually increase to 65. This is being phased in over an eight year period from April 2010 to November 2018.
people born before 6th October 1954. The State Pension age for men and women born after 5 April 1960 will gradually increase to 67. This will be phased in between May 2026 and February 2028 for people born between 6th April 1960 to 5th March 1961. For more information on PAYE, visit HMRC or contact us.